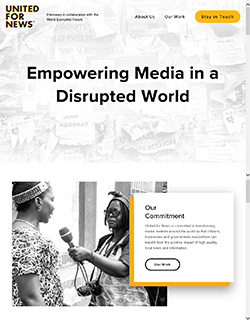 United for News is committed to transforming media markets around the world, so that citizens, businesses and governments everywhere can benefit from the positive impact of high-quality, local news and information. As our global commons increasingly moves to digital tools and platforms, we are experiencing a global crisis in trust: in government, institutions, media, and each other. We are also experiencing acceleration in the spread of “fake news,” including propaganda, hate speech and misinformation. These massive challenges are the most tangible symptoms of a profound disruption in human communication. The transition to digital tools and platforms has irrevocably altered the way we produce and consume news, information and content around the world. This transition to digital and mobile platforms is hitting local media particularly hard, undermining the sustainable creation of quality news, increasing distrust in media, and exacerbating the “post-truth” environment, particularly in markets where news organizations are operating with low capacity or under threat. This is a shared, global crisis that will grow in magnitude as the next 3 billion people come online. We must work now to support local, independent media, ensuring that all communities are empowered with the capacity to produce and engage with quality, trusted and inclusive information. United for News, a multi-stakeholder coalition, is led by the international non-profit Internews in collaboration with the World Economic Forum. It seeks to support local media organizations in their transition to digital; to foster economically viable creation and distribution of trusted content; and to increase the positive impact of quality content on the well-being of native businesses, government, and citizens. United for News believes that the challenge facing local news and information demands systemic interventions that require cooperation by a range of stakeholders. These range from the global media industry to international brands, and from mobile operators, technology platforms and advertisers to the local independent media organizations struggling to survive across the world. United for News will undertake research and work streams that leverage the core competencies of all stakeholders. Current members include the World Economic Forum, Internews, Bloomberg, GSMA, Vodafone, the News Integrity Initiative, the London School of Economics, the Global Forum for Media Development, the Media Development Investment Fund, Omidyar Network, AppNexus, GroupM, SembraMedia, Edelman, 50/50 Project, and WAN-IFRA. Each member shares the unifying commitment to strengthening quality, local media. Given the interests of the stakeholders and the potential for system level impact that the United for News community can provide, our agenda for engagement includes four critical areas that must be tackled for local media to survive and ultimately thrive in a digital world. United for News will encourage and support the emergence of research and pilot initiatives with potential for systemic impact, prioritizing those that include diverse stakeholders and impact a range of markets and regions. In 2018, the coalition plans to undertake a set of focused initiatives with the potential for systemic impact. 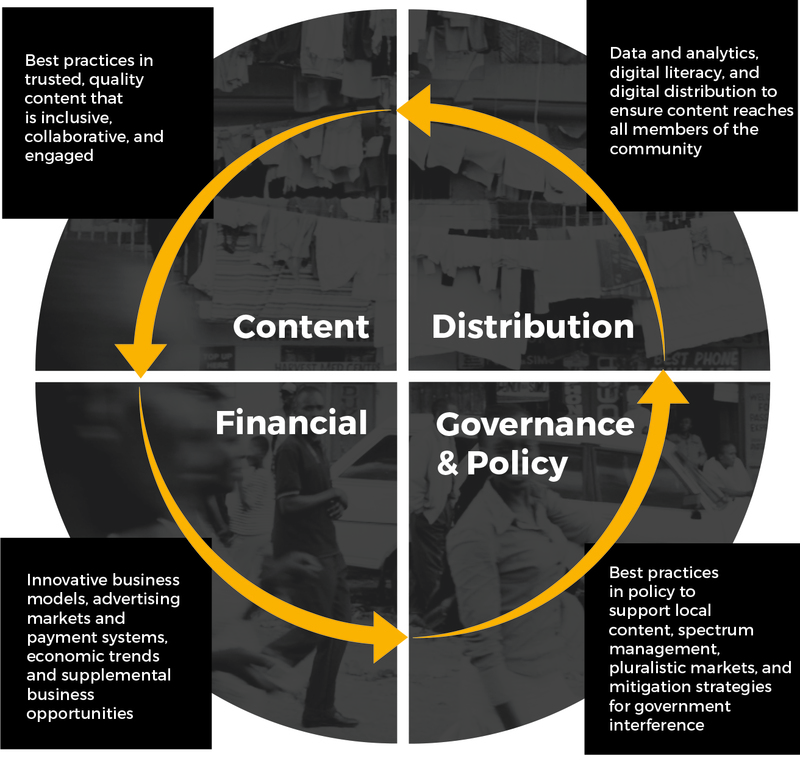 These initiatives fall into two overarching categories of concern – supporting the sustainability of media and rebuilding trust. We believe working across these two deeply interdependent and mutually supportive categories will deliver the greatest impact. United for News will pilot each initiative in country markets around the world to ground truth the work in specific media contexts. Watch Jennifer Cobb's presentation on United for News at the Global Philanthropy Forum 2018. Contact: Jennifer Cobb, Director, United for News, jcobb at internews dot org.